Who among us hasn’t wondered at the true identity of the charming Lem Lemoncloak? One of the leaders of the Brotherhood without Banners, Lem appears on the page with no true name and no history, although we have names and stories for many of his fellows, including several of far less significance to the narrative. Some time ago a chance combination of musings inspired by the questions of fellow posters at westeros.org led me to connect Lem with another character whose name is mentioned but once and who is alluded to on only one other occasion. What would lead one to connect Lem with Ser Richard Lonmouth, erstwhile squire and companion of Prince Rhaegar Targaryen? To be honest, at first it was nothing more than the colour of his cloak combined with the conviction that the knight of skull and kisses is meant to be significant. But it turns out that there are quite a few textual hints that support the connection. While I initially laid this theory out on my own, much credit must be given to posters at westeros who picked up this cracked pot and ran with it. I don’t think it’s an exaggeration to say that with their help, this pot will now hold water. With the bard Tom o’ Sevens the connecting reference at both meetings is a song. For Lem … kisses. The arms of House Lonmouth have been described as “quartered of six: red lips strewn on yellow, yellow skulls strewn on black.” It was the connection of kisses, skulls (bones) and yellow with Lem which provided the “aha!” But the connections do not end there. Here we have no clear indication of which House he would side with: that of his friend and mentor Rhaegar Targaryen or that of his drinking buddy and overlord Robert Baratheon. But perhaps the words of House Lonmouth might be a hint that Ser Richard did indeed take a side. Lem is involved in choices being offered by the BwB, while there is also enough evidence to speculate he has made other fateful choices in his past. While “choice” can be seen as a major theme of ASoIaF, the fact that it is prominently featured in the house words of a minor house seems almost like a flag saying “look closely here”! Looking closely in this case has certainly led to some interesting theorizing. Why would Anguy say such a thing? Could it be that Lem once drifted in the river with the dead? Much later the Elder Brother on the Quiet Isle tells Brienne his story of being left for dead in the river after the Battle of the Trident, and washing up downriver, alive and reborn to a new life. Could something similar have happened to Lem? If Lem is Richard Lonmouth, he might have been present at Stoney Sept with Robert and be known to Tansy from that event. If she had knowledge of him being a knight in service to the man who went on to become the king, it might well explain her “Kingsguard” joke. But why vanish from the page then? Speculation brings us back to AFfC, and Brienne’s POV. In chapter 25 Septon Meribald describes to Brienne, Pod and Ser Hyle the inner turmoil of the broken man. Going right on assuming Lem and Richard are one and the same, I will posit that Richard Lonmouth’s family was in King’s Landing during the Rebellion. Perhaps his wife came from a loyalist family, perhaps they thought it would be a safe place to retreat to. But we know that when the Lannisters sacked the city there was no mercy for anyone, from the royal family down to the poorest smallfolk. Could his wife and daughter have been among the casualties? It might explain his need to hang “lions” and judging by his comment, his association of them with that act. Finally, Lannisters being the new good-family of his former overlord might make it once and for all impossible to come forward and publicly serve Robert. And bind my hair with grass. and me your forest lass. Here then we arrive at a possible narrative purpose for Lem being Richard Lonmouth. He might be able to shed light of Rhaegar and Lyanna’s first interaction, the reason Rhaegar crowned Lyanna QoLaB and possibly (if he remained in the Prince’s confidence) events that came after. At the very least he would be one of the few attendees of the Harrenhal tourney who is still alive. This would place him in the same category as the elusive Howland Reed of One Who Knows Much and More. In conclusion, Ser Richard Lonmouth, whose house colours are black and yellow, is never mentioned after his cameo at the Tourney of Harrenhal. 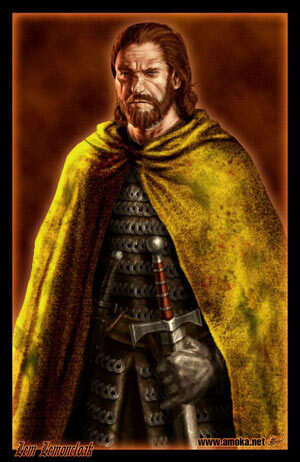 During the Wot5K an outlaw of no known name or history appears in the Riverlands wearing a distinctive yellow cloak of heavy (and most likely at one time, expensive) cloth. In his arc, Lem is associated with kisses and choices, both known motifs of House Lonmouth. Based on these associations, a connection between the two can be made. Close reading further allows us to enter into some speculation to fill in the details of the intervening years. Finally, as to the significance of this theory, if he was a part of the search for the knight of the laughing tree, and some revelation was made, Ser Richard could be possessed of interesting insight into the story of Rhaegar Targaryen and Lyanna Stark. Prince Rhaegar’s support came from the younger men at court, including Lord Jon Connington, Ser Myles Mooton of Maidenpool, and Ser Richard Lonmouth. 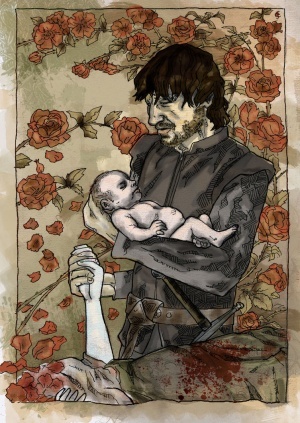 The Dornishmen who had come to court with the Princess Elia were in the prince’s confidence as well, particularly Prince Lewyn Martell, Elia’s uncle and a Sworn Brother of the Kingsguard. But the most formidable of all Rhaegar’s friends and allies in King’s Landing was surely Ser Arthur Dayne, the Sword of the Morning. Let’s revisit Ser Barristan’s information: “Myles Mooton was Prince Rhaegar’s squire, and Richard Lonmouth after him. When they won their spurs, he knighted them himself, and they remained his close companions” With that in mind, combined with the information in TWoIaF, we can surmise that the half dozen companions were most likely Arthur Dayne and Oswell Whent (as previously revealed in the WoIaF app) Mooton and Lonmouth (both identified as close companions of the Prince on more than one occasion) and possibly Connington and Prince Lewyn Martell, whom TWoIaF indicates were also strong supporters of Rhaegar. Given the outcome of the Rhaegar and Lyanna situation, with Aerys executing Rickard and Brandon Stark and calling for the heads of two of his Lords Paramount, we propose that Richard Lonmouth chose Robert in the Rebellion in order to effect that regime change it was earlier implied he supported. Remember that quite early on Rhaegar was well out of things and the Rebellion was technically against Aerys, aimed at removing an increasingly mad tyrant from power. Rhaegar’s eventual involvement– no doubt out of a sense of duty to his House and perhaps an effort to safeguard his children in King’s Landing– would play right into the themes of choice and the broken man that were identified earlier. For the record it doesn’t seem like we’ll have to wait too long to put this theory to the test. Last we saw of the Riverlands in ADwD, one person who likely knew Richard Lonmouth was on a collision course with Lem Lemoncloak and is a strong candidate for a reveal. When Jaime Lannister resurfaces he may find himself in for a surprise reunion with someone from his past.